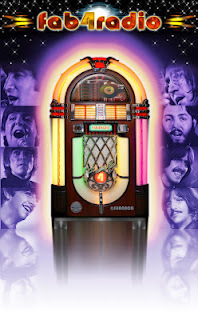 The #1 internet Beatles radio station! Hello Ed, we've listened to our rendition of "Handle With Care" broadcasted by Fab 4 radio. It was a great emotion, especially for my sons. We all like so much the radio; we appreciate so much the chance to hear alternate or rare versions of famous tracks and related artist's songs as well. I particulary like the Apple Jam; I've suggested to my sons to work on unfinished songs, but you know, they're very young so they know mainly the famous songs and they love to play them, but Apple Jam's work on unfinished demos is amazing!!! In a word, we'e become massive fans of Fab 4 radio!!! 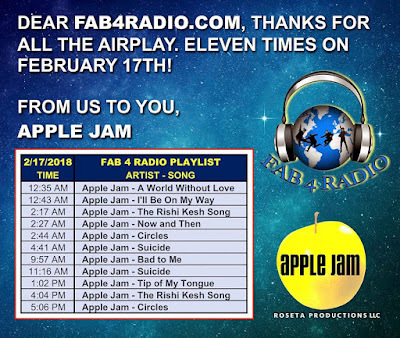 To hear lots of Apple Jam songs along with everything Beatles, be sure to listen tofab4radio.com! — with Sara Lenth Roseta, Dennis McMurtrie, Beatle Ed, Rick Lovrovich, Steven Roseta, Johnny Jones, Doug Kilishek, Jakael Tristram and FAB4RADIO.com. It was super easy for me. I have Fab4Radio on throughout my workday, almost every day (I know, I’m obsessed) so I actually heard a bunch of the clues before I decided to enter. I supposed if you had a more pricey prize (e.g. a Beatles or McCartney box set), then maybe you might want to make it a little more challenging. But this one was a piece of cake. Tody we give thanks for all of the good things that we enjoy...like the Beatles and Beatle Ed who keeps the Beatle fire burning 24/7! Thank you, Beatle Ed! amazing, I get enough of this station - so many great rare songs!! Put your Beatles records, tapes, and CDs away. You do not need them anymore! hey a quick note --- I loved your McCartney month! Now this is what i am talking about... All Beatles all the time. FAB4RADIO - fan for life!!!! WOW!!! What a blast from the past. This radio station brings me back to the day of radio listening for my the Beatles - John, Paul George and Ringo song. keep on playing so many of the great songs and sounds. Got the "NEW" McCartney CD and I'm extremely happy with it. Peggy White: Hey there Beatle Ed! So happy you got to see it in your home town of Minneapolis with your family and friends. You helped so much with Kickstarter to raise the funds to produce the film! Would not have happened if we had not made that goal! What's not to like about Fab4Radio!! It's got everything you need,satisfaction guaranteed! Keep up the great work and bring it to all the countries!!! I love FAB4RADIO.com because it is the best Beatles station, anywhere. You play all my favorite lesser-known Paul McCartney tracks and lots of live versions, and alternate and rare versions. Your programming is the best and it's not just the same Beatles songs over and over like you hear on regular stations. I appreciate what you do and am glad I can tune into fab4radio.com. Thanks for a great job! Fab4radio is special to me because it doesn't matter where I am or what I am doing; if I have an internet connection and a pair of headphones/speakers I can always tune in and i can guarantee I will know and love every word from every song played. This is an easy one. I like Fab4Radio because I've loved The Beatles since 1964 and I can hear them any time I want to on Fab4Radio. There's nothing better than that! THE MOST ELECTRIC MIX OF THE FAB FOUR ANYWHERE ON THE INTERNET OR COMMERCIAL RADIO!!! You played a live, with audience, version of Besame Mucho at about 12:35 am Eastern Time (US) on Sunday (about 5 mins ago as I'm writing this). It sounded terrible, but it was the best version of that song that I have heard by The Beatles! What on earth was that from? It was not Star Club. It sounded more like it was from some BBC show. Do you have more from that show? What other songs are even available from it? I would love to hear more! You are playing great stuff tonight, BTW. Thanks and keep it up! Fab4Radio is special to me because of the great mix of music. Whether it's the Fab 4 or friends, the songs and interviews bring back a joyous time for me. I get the same feeling waiting for the next song on Fab4Radio as I got waiting for the next Beatles record! Keep up the great work! I want to hear more, more, more! I really enjoyed your station to the utmost !! I'm 56 years old been and have listening to the Beatles since I was 8 years old when I first saw them on Ed Sullivan. From that time in 1964 up to present day 2012, I've enjoyed and have appreciated this music with all the available technologies available. This includes the original vinyl records (which I still have), 4 and 8 track tapes, playtapes, cassette tapes, original compact discs from, 2009 Remasters on CD (Both in Mono and Stereo), and on ITunes. I hope to get the Vinyl remasters shortly. The point I'm making is that I feel very fortunate that the Beatles music has been accessible to all these technologies during all this time. In my opinion, your station is very special and instrumental in promoting a deep appreciation and awareness of their music for upcoming generations. When you add the sound quality, variety of music your station plays daily, along with the artwork and weblinks on your home page, your station is indeed very special. Hi, Fab4Radio is special to me because I love The Beatles music and over the years they have gotten me through a lot of tough times in my life. No matter how I felt whenever I heard the Beatles It always put a smile on my face and made things better. So Fab4radio is wonderful to hear. It always makes me feel better and smile. You guys are great!!! Hooray ! for Fab4radio !!!!! !